A border war is, or should be, a simple thing. Two kingdoms want land, to the point of battles and blood; they fight it out, until one gets the land and the other finally goes home. Tragic, as we all know, but straightforward. But in the war Dissonay and Skarda wage over the unclaimed Territories, nothing is straightforward. Beyond the dispute over the land is a riven family, rumors of an unfaithful queen and brothers-in-law turned against each other and cousins crossing swords to the death. Further yet, a more distant kinship is the heart of a more ancient feud, where lost heirs and lost swords are menaces to the Mad King. And at the furthest edges, old, inhuman powers reach hands into human battles. 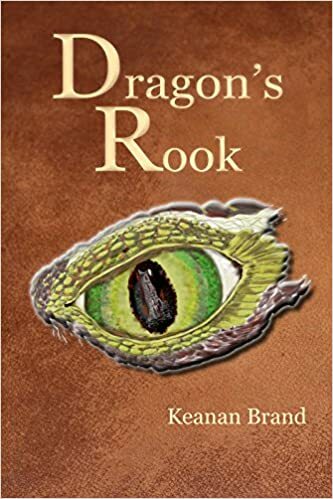 In Dragon’s Rook, Keanan Brand spins a complex and epic tale. The novel is high fantasy, of an old-fashioned flavor. There are bits of an invented language, and the story is more multi-threaded than I see in most contemporary fantasy (excepting works by Stephen Lawhead, an old-fashioned author in his own right). The book itself is long for a modern novel – just breaking 500 pages. A second book will finish the story. It might have been possible to shorten Dragon’s Rook and create a duology, and I salute the author for not doing so. Dragon’s Rook ends in a good place as it is, with its climaxes and converging story lines. Additionally – I will confess it – I have seen so many trilogies, a duology spices things up a bit. Dragon’s Rook features a large cast of characters, all realistically drawn and many vivid as well. Relatively few got under my skin, but they did exist: Maggie, Yanamari, Mad Morfran and, to a lesser extent, Kieran and Rhon. I felt a couple more would have, had they been given the stage for it. The plot moves through many dangers, and the author lets this take its toll on the characters. A number die, and not only throwaway characters. I am inclined to think too many died. But the author’s willingness to discard characters has its upside, most notably in paving the way for a brilliant new villain. This novel possesses a strong religious element. Characters struggle with questions of suffering, God’s will, and their own free will. Unlike much Christian fantasy, the outward forms of religion are built into this world: churches (called kirks), priests, religious signs, funeral rituals. Superstitions and a dark, sorcerous order are also part of the religious landscape. In this, as in other ways, the world-building is realistic and thorough. Although the book is not generally graphic, there are grisly moments. I found one scene hard to bear. The large cast, though mostly a strength, had a negative side in that the characters were sometimes hard to keep track of. It wasn’t always easy, for example, to distinguish one secondary member of the Fourth Lachmil from another. Dragon’s Rook is strongly written, with beautiful phrases and evocative descriptions. It is a complex epic, drawing its characters from many different corners to face the revival of old hostilities, old legends, and old hopes. Recommended to all lovers of high fantasy.